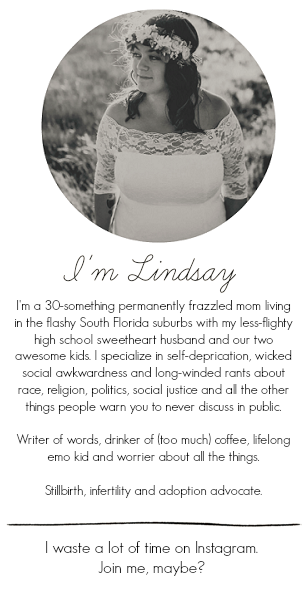 For starters, pardon any strange typos that will appear in this post. As fast as I caught strep from Ethan (I was really trying not to be pessimistic, but I knew it would happen! ), my laptop keyboard stopping working. I've been confined to my sickbed since my strep diagnosis on Friday night and am using my husband's teeny, tiny little work laptop to get this post done. Which, really, I felt needed to get done because it was brown week and brown week was awesome! Bear with me here. 1. 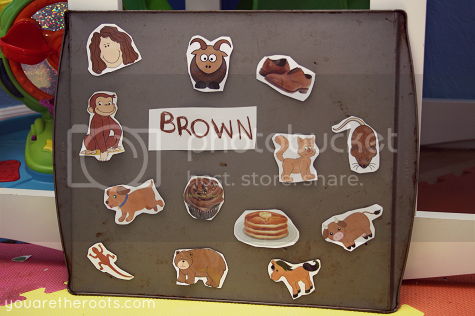 BROWN MAGNET BOARD - The magnet board was a huge hit this week, thanks in part to the appearance of Curious George. 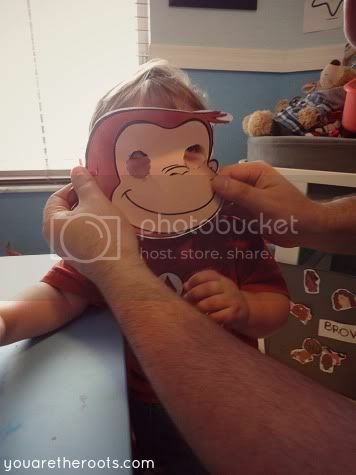 Ethan is really, really into Curious George lately so I tried to keep him a big part of brown week this week. 2. 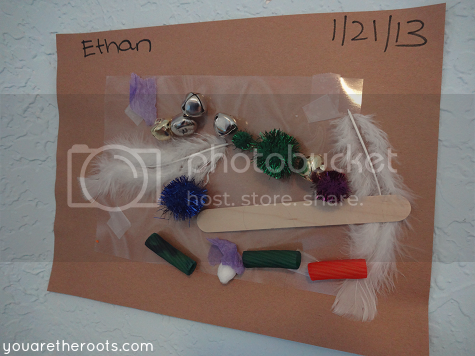 OBJECT TO PHOTO MATCHING - The goal of this one was for Ethan to match a photo of an object with the actual object. 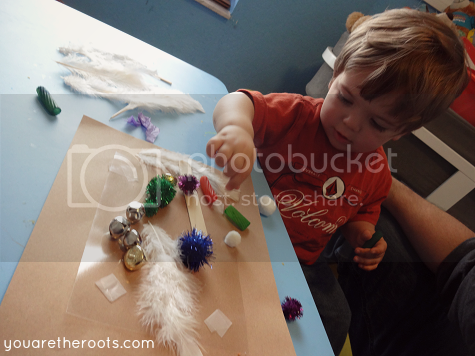 He absolutely loved this activity so much I'm going to be repeating it with new items this coming week. 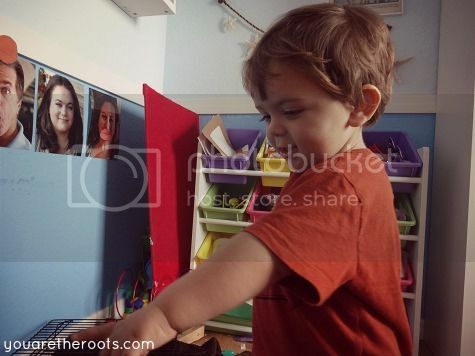 He would smile so big whenever he'd match the item with the photo. 3. 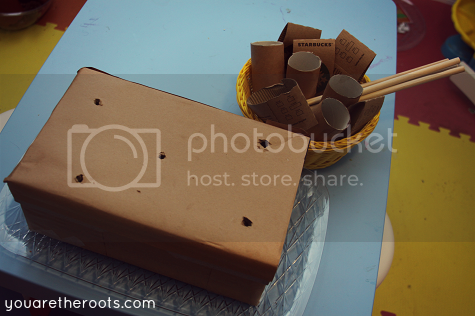 BROWN BOX BUILDING - I wrapped a shoebox in brown construction paper and filled a little basket with some brown dowels, empty toilet paper rolls wrapped in brown paper and some Starbucks hot cup sleeves (that I totally trash-dived for in my dad's home office trash can. He's a Starbucks-every-morning kind of guy). 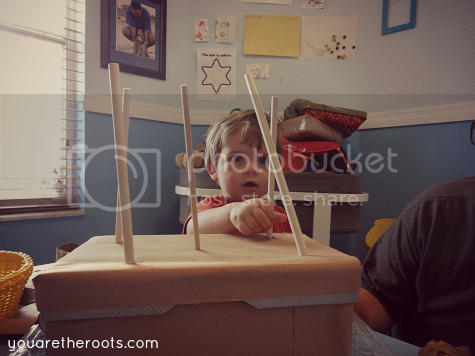 I poked some holes in the box big enough to accompany the dowels and let Ethan go to work with his imagination and creativity. This one was my favorite activity to watch him do. 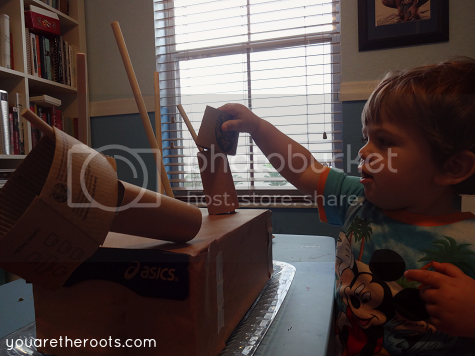 It was really cool to watch him use his imagination and see how he'd "build" his shoebox castle (as we called it). 4. 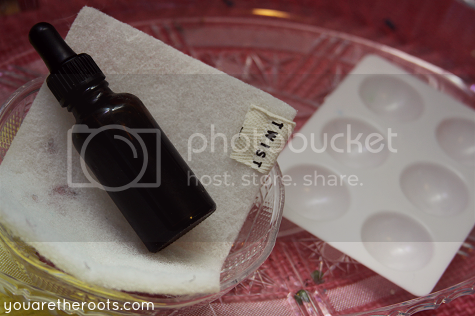 WATER TRANSFERRING - I had this brown apothecary bottle and figured it was a good activity to try. I filled it with water I colored blue and Ethan could transfer the water onto a sponge, into a bowl or into the wells of a palette. 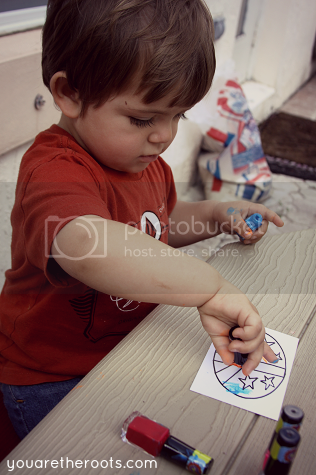 He had no interest in doing this activity at all, not even once I showed him the water was blue. We essentially ignored this one this week. 5. THE CAR WASH - Hello, biggest hit of the week! 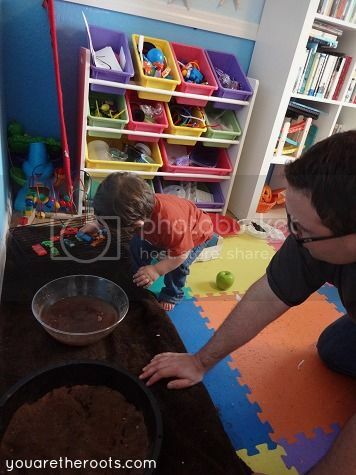 Ethan asked for "dirt? cars?" as soon as he woke up each morning. 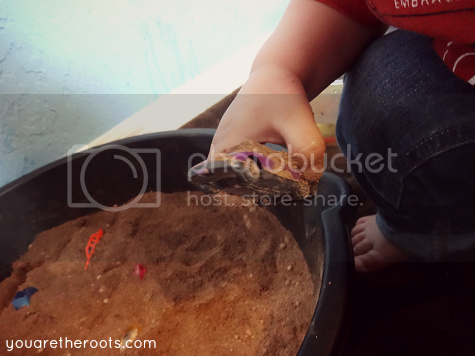 I had filled a big tub with coffee grounds and cocoa powder and hid some little matchbox cars in the "dirt." The middle bowl was filled with water for Ethan to wash the cars off and then I stacked some baking racks on the end for the cars to dry. 6. 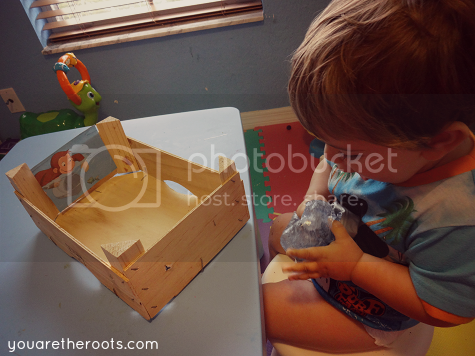 SENSORY BIN - The sensory bin was seriously lacking this week. I wasn't expecting Ethan to have any interest in it, but he kind of did. 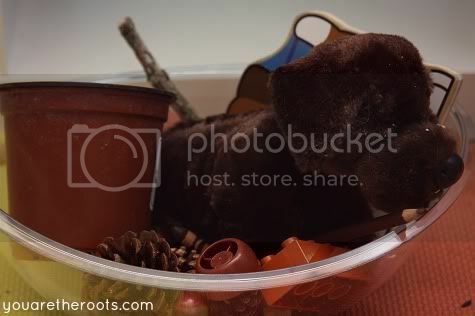 I'd borrowed a stuffed brown dog from my sister's old stuffed animal collection and filled the bin with other little brown things I could find, mostly sticks, twigs, pouch tops, etc. 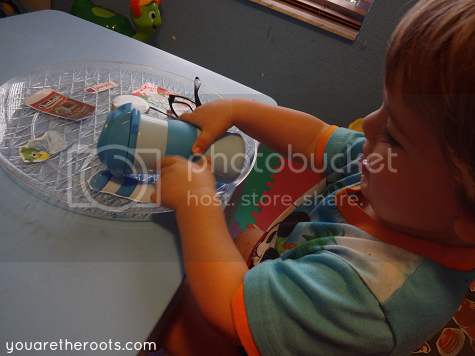 Ethan had some fun with the little flower pot and placing the smaller items into the pot and he also loved the stuffed dog. 7. 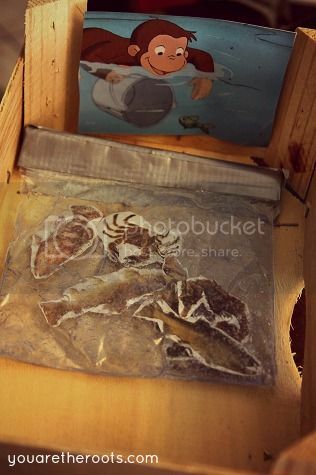 CURIOUS GEORGE FISHING - I found an image of Curious George swimming and looking at fish and attached it to an old clementine carton. I filled a Ziplock bag with some blue hairgel and also some printed (and laminated!) pictures of brown fish and sea creatures. 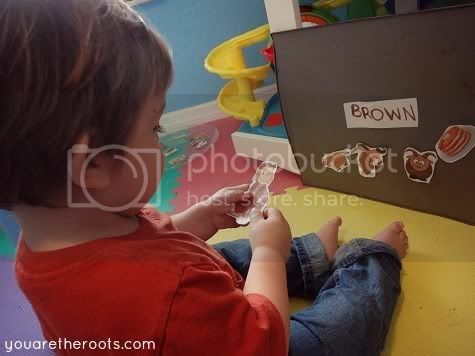 Ethan got to squish the bag around and watch the brown fish "swim" around. 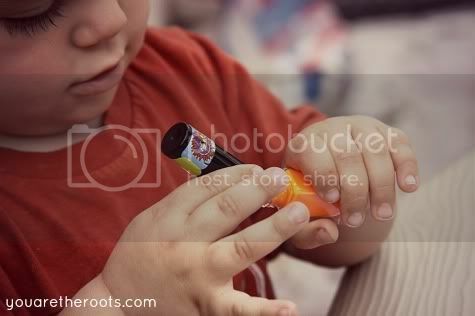 He thought this one was really cool! 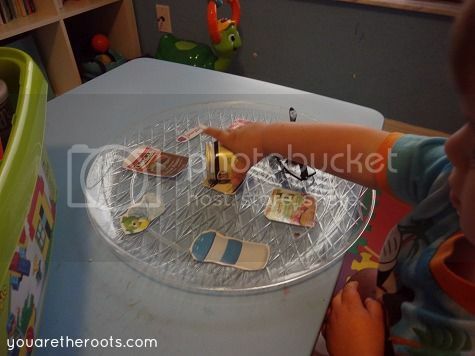 I attached a sheet of laminating paper -- sticky-side up -- to a piece of brown construction paper and gave Ethan some items to stick to the paper. 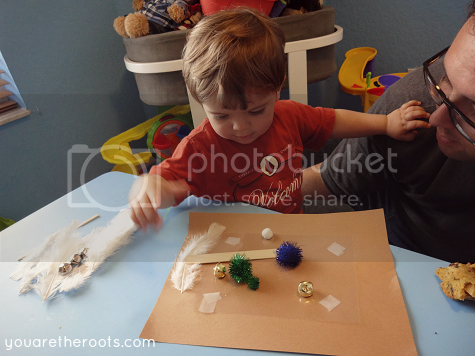 He had a blast doing this activity! 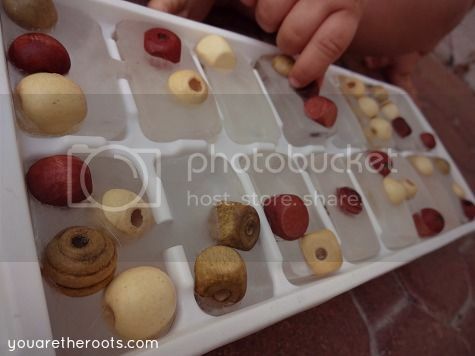 We also froze some brown beads and shells in some ice and had a blast playing with them outside. 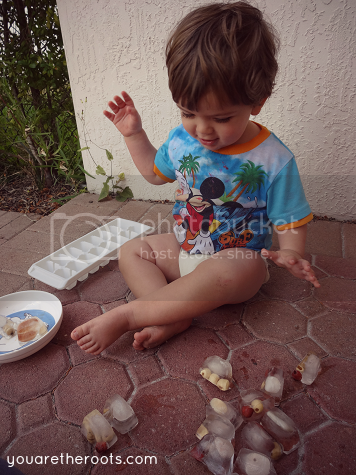 Ethan enjoyed sorting the ice within the tray, in the bowl and also learning if he smashes them, he can get the beads out. 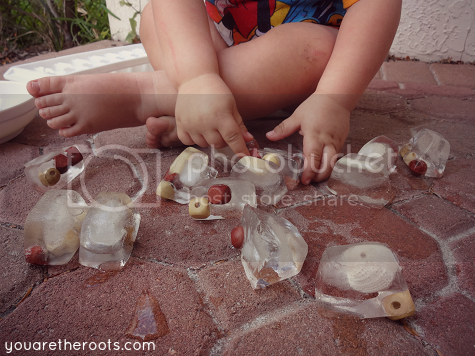 Eventually he learned as they melt, the beads come loose. 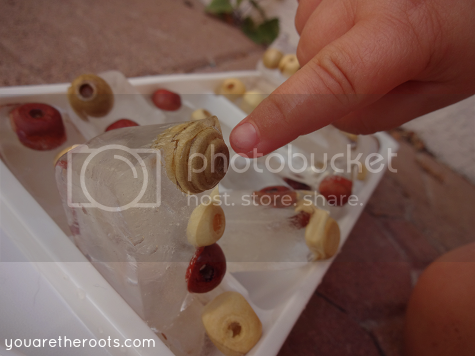 We spent a good hour outside playing with the "brown ice!" 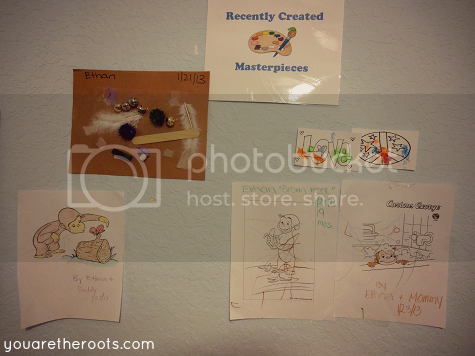 We did some coloring and also some painting with EZPaint (which is still such an awesome fine motor activity, too!). I had a few more art projects lined up but then strep happened and, well, we didn't get to them all this week. This will have to be continued next post! With the plague lingering around our house, I haven't even gone through our big bag of library books yet! This will spillover in next week's post! Thank you! 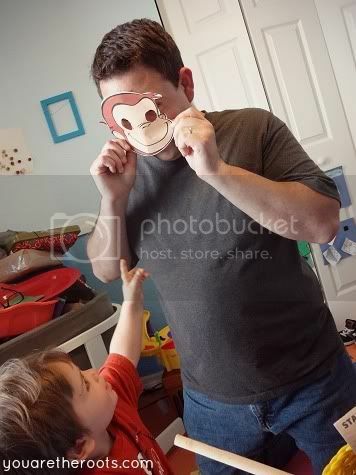 Thankfully I feel 100% better today and I think Ethan does, too, minus his cough! At least we got this over with now and not on my birthday in a couple of days! Always! Tot School is my favorite, haha. I LOVE the washing cars idea! I'm totally stealing it from you for our C week! 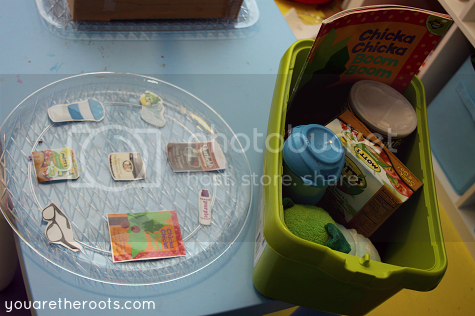 Our tot school room smelled SO! GOOD! the entire week, I was sad to see it go! Haha. Tot School has been an awesome experience! I learned about it from Nicole (thekavanaughreport.blogspot.com)'s blog -- she's my Tot School hero! It's been such a blast. 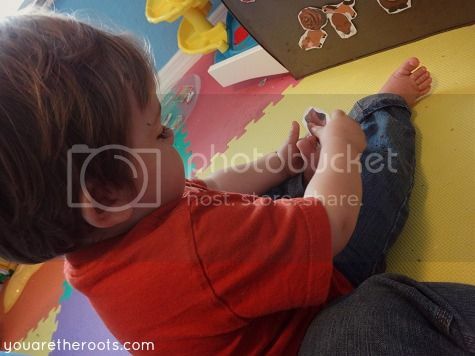 Ethan and I both look so forward to our Tot School time together and it's the coolest thing watching him learn. 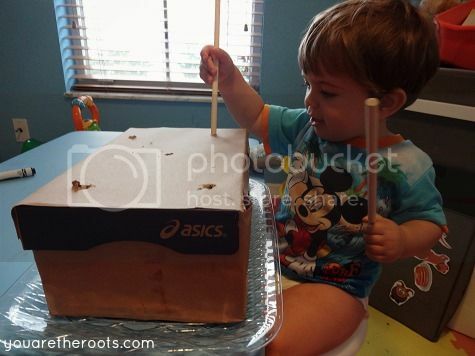 Pinterest has some great tot school and sensory activities, too! 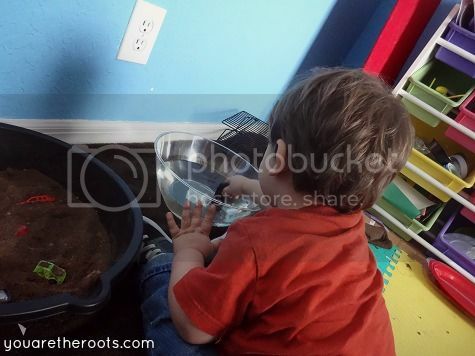 I can't wait to hear how he likes the dirt box! Ethan had such a blast with it. Of course, there was cocoa powder and coffee grounds all over the wall and floor, but so worth it, haha. OH NO! I can't believe you both ended up with the flu, too! That's awful! I hope you guys feel better soon and that flu is gone for good!